This goes for both here and probably "NPF 2: The Sequel, The Movie" if and when that gets set up And how quickly my crame sessions lead to improvements. So I won't be posting much artwork on here beyond wips. The reason is because I want to finish improving on the dynamic lighting, Hue Shifting properly, Lighting and color relations. Design basics, and avoid tangents in artwork/photography. No doubt these are the biggest reason why my best still pales compared to the works of others. This can hurt the game project a lot If I'm not careful so I'm going to be focusing a lot more in this area. I'll have a Huge amount of time to study and practice. At least 12 to 15 hours a day so that I can master this as quickly as possible for the sake of the project and the sake of my own artwork. I want to make a very big leap and finally master what i've been studying over the years asap to reduce any more issues that will hurt the game projects development and reception upon release. And a lot of this is stuff I should have mastered by now over the course of these last 7 to 8 years. After almost a decade I should be much better than I am now. So things might be a bit dead on all of my accounts across the Internet and here for awhile save for WIPs here and there. While I work on improving in the areas I'm lacking in. Last edited by Kyanbu The Legend; 08-18-2016 at 05:19 PM. Visit Kyanbu The Legend's homepage! Update: I have returned from the Room of Spirit and Time! And it's all finished. This took longer than expected. Largely due to the leaves and all of the trial and error with trying to find the right references for them both on the net and outside in my area. While it took me about 128 layers with no masks to make this Most of those layers are either dummy layers or back ups due to me adjusting the rendering on the background and leaves back and forth. Been working towards working with fewer layers to keep the sizes of the Xcf original files down as much as possible. With this portrait I went with a Autumn Sunset design for the background and color theme, to match the character better. The other WotFS Portraits will follow this pattern with the exception of Vivian, their leader. Unlike previous CGs where I didn't go back and fix them and instead apply what I learned on the next piece. I'll actually be going back and fixing this up based on the feed back I get. Though if it has to be completely redone then it'll have to be shelved until the other 4 are finished. For the sake of not delaying the current project any farther. This started out as a digital hand drawn sketch in GIMP 2.6 using my Wacom Bamboo Tablet. The character was colored using the brush tool and rendered by hand using the brush tool and color theory:Hue shifting using reds and violets for shadows. The canvas was enlarged during the coloring phase to correct a tangent. The Background Trees were drawn and rendered by hand. So where the leaves with where detailed by hand, duplicated via copy/paste (far back leaves), and each rendered by hand with the brush tool. I then glossian blurred each section of the background at different levels to help with depth and bring out the focal point of the Portrait. And now about the character. Bio: A High School friend of Vivian and a member of her traveling Guild "Witches of the Four Seasons". Known by many as the masked vigilante "Autumn Harvester" back in her home country of "Mel Dine". Abbigail is a farmer from Mel Dine's countryside whom earned a chance to study at Nova Academy. A renowned School in Mel Dine's capital "Alexander City" for gifted Casters. After one of it's professor successfully caught her and offered an ultimatum. Come with him to the academy to study and hone her skills for a better purpose. Or go to prison for her crimes against the Upper Class Nobles. While she hated the capital and the Casters that looked down on the countryside. She reluctantly agreed and joined Nova. Where she eventually met and befriended "Vivian Vale". After graduation she became her guild's first member. Abbigail loves messing with others and can be a bit playfully harsh towards her fellow teammates who aren't Vivian. And loves hanging around with Sarina. As the "Autumn" member of her guild, Abbigail specializes in powerful Wind and life draining Dark spells. And prefers to use Sickles and Scythes. Personality Tropes: At her best she's witty, clever and sarcastic. At her worst she cruel and a sociopath, especially towards the wealthy. Usually she's a lovable jerk. And Winter's Portrait is complete. Taking advice that I got from Autumn's portraits. I made some additional fixes as well as taking an impressionist approach to the background to increase focus on the focal point (the character) and improve depth. The character was sketched digitally, colored and rendered by hand using the brush tool. hair texture and hat fluff textures were also drawn and rendered by hand. The Background trees and snow were digitally painted using a soft brush to retain a blurred look as if it was being seen from a glance. I'll be doing this more frequent from now on when it comes to these types of CGs. The Ice shards were painted and rendered using the brush tool as well. With the two closest to the viewer being painted with a soft brush for a hand made blurred look. I wasn't able to really improve the values as much with the background due to the nature of the lighting. The main light source is her hand with the secondary source being the light bouncing off of the snow and ice shards. So the far background wouldn't be visible past a certain distance at night in the middle of the woods. It reads fine but it could have been better. And is more due to my choice in backgrounds. For those curious, I use the Grey Scale method of values checking. I don't really like blurring my eyes unnecessarily. Total Layers used: 69 (the background being painted across only 3 for the trees and sky and shared layers for rendering cut the count down a lot). I'll be averaging at around 20 to 50 layers from this point on as I get more comfortable with painting over layers the traditional way. Bio: A skilled Wise Caster from the mountain region of Lucidia Island whom Vivian hired to serve as the guild's "Winter" member. Eventually becoming good friends with her and the other members. Having a natural resistance to extreme low temperatures, Rin often loves to tease the other members whenever they complain about the cold winter weather and snow that usually results from her spells. From verbal to light clothing in the winter time and while casting said spells. Rin specializes in ice and wind spells. Combining the two to simulate extreme cold weather such as hail and blizzards in general. Living up to her nick name "Winter Goddess". While she has great offensive power, she tends to focus on defensive counters to slow or stop her opponents cold in their tracks. Personality Tropes: At her best she has a gentle and charming personality. At her worst she's insensitive to others when it comes to the cold, and personal space, coming off more as a Aphrodite. Usually she's fairly upbeat and entertaining. I'd recommend going back and re-doing the hand. The first thing I see when I look at the piece is the fact that the fingers (Especially the thumb) look incorrect, and because it's where the action is happening, it really detracts from the piece. Thanks for the feedback RPG, I'll go and correct that. Following the advice/feedback I received from past works. I took and impressionist approach with the background. Digitally painting and blurring it by hand with minimal detail to make it seem as if it's being looked at from a glance. The character was drawn and rendered by hand using the brush tool. As were the textures for the Plant Creature on the right and her hair. The god rays in the back were also done by brush and added mainly to help with the color values of the background. So that the image reads better. While I am cutting done on the number of layers used, this one still ended up a bit close to 90 when I probably could have reduced that to around 50 or lower with more layer sharing for the different parts of her Dress and hat. While the other WotFS portraits show the characters with their weapons. This one was a bit different due to the nature of Spring's powers (control over plants and plant-creatures). So this one instead has a secondary focal point, the little plant snake to the right that I mentioned earlier. Normally this is something you should avoid when it comes to composing a scene for a pic. But I felt it was kind of necessary and I think it turned out well though I'll find out for sure after looking over the feedback. 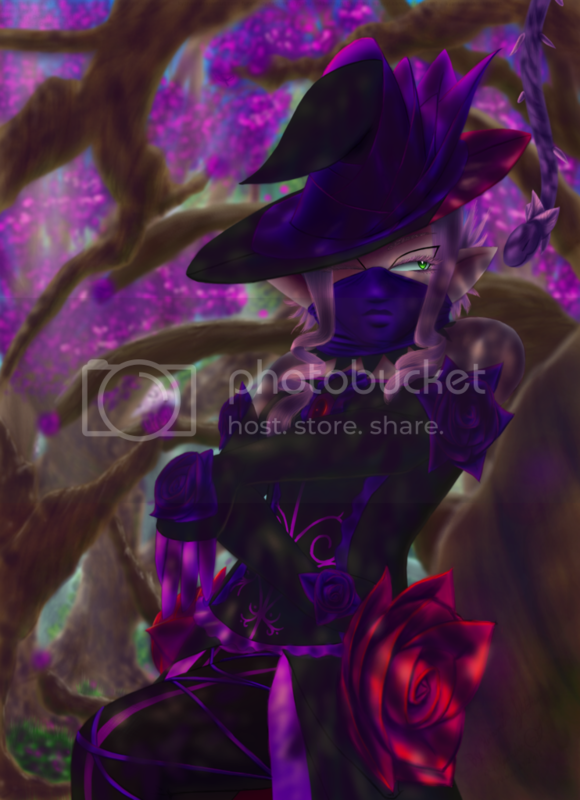 Bio: A skilled Wise Caster from the nation"Rosa" and former member of a Guild of Nobles called "Silent Thorn". After quitting the guild due to mistreatment from their leader and fleeing the country. Fleurette learned about Vivians new guild after seeing flyers posted around "Alexander City" Mel Dine. Impressed by Fleurette's incredible use Earth and Wind Spells and her control over plant life. Vivian hired her as their "Spring" member. While she's great friends with Vivian and Rin (Winter). She doesn't get along well with Abbigail (Autumn). Partly due to Abbigail's tendency to use her plants as target practice for her Wind and Dark Spells. Fleurette is often very quite. Rarely ever speaking, even to those close to her. Which tends to aggravate Abbigail. Despite this, she's a very cheerful and mostly spends time tending to her plants. Despite being the "Spring" member, she tends to favor gothic style black dresses with very few bright colors if at all. Fleurette or "Spring" as she's often called by her friends. Specializes in Earth spells and has the power to control plant life. Combined with being very handy with Wind and Water Spells and being able to cast spells remotely using the plants she controls, She is able to often over whelm her opponents very quickly in Forests and Jungles. When she was in "Rosa" as a member of "Silent Thorn" She was known as "La Forêt Noire Sorcière". Though she never was very fond of that title. Personality Tropes: at her best she's quite but perky very friendly towards others, at her worst she's harsh towards those that harm plants unnecessarily and dislikes reckless Fire users, Usually she's quite timid and very sincere. I got my critiques in and the portraits are all failures. time to go back to the drawing board again. Time to go back to basics again. I've improved a lot over these 8 to 9 years but I'm still not industry good. I need to study life even more. First I need to recheck my sources for art studies. If they really aren't as good as I thought then I'll have to find new ones. As for the game project, I'll be focusing only on story and level design from now on. Artwork will now only be practice work until Xmas. I gotta take full advantage of my time since Art Commissions are not happening any time soon from the looks of it. And improve as much as possible as quickly as possible. I should be able to get in about 8 to 9 hours a day of drawing. Last edited by Kyanbu The Legend; 11-02-2016 at 01:47 AM. Don't get discouraged, Kyanbu. Your art has improved for sure, even if it's not where you want it to be. I admire how you keep striving to improve. But I want to say that, while you should keep practicing and getting better, your art doesn't need to set the world on fire to make it into a video game. Or a comic or a cartoon, for that matter. The Simpsons doesn't have amazing art. Crayon Shin-chan is pretty much scribbles. Have you ever read Yandere Kanojo (she's a yankee, not a crazy person)? It's really funny, and the art is crap. It started in a digital magazine, got a simultaneous run of completely different chapters in the print version, and the author is now running a new comic that still looks, art-wise, much worse than your stuff. It was successful and good with bad art, and the author is still in a job. Just, don't get discouraged because people tore your work apart. I don't think that, right now, you're trying to get hired by Bioware to draw the next crop of virtual wives and man-wives for whatever new RPG they must be working on. You're trying to make your own game, and as long as the art reflects yourself and the game is fun, then you're doing alright. Hmm it seems some of the WotFS (Witches of the Four Seasons) characters/Bosses don't completely fit their respective Season (after additional research on the meaning and emotions tied to the Seasons). That was some what on purpose but still It makes it hard to compose the scenes since the character and season clash to a degree. I'll have to find a middle ground somewhere to avoid making an obvious cliche with their personalities and keep them well rounded. What are your thoughts on characters whose powers and personality match? Wow it's been forever since I've posted an update here. Much has changed but mainly in design and concept and me thinking about just doing this as a web comic for the time being while I build the game in the background for a while. One major change is my decision to redesign a number of character outfits. Both to desexualize designs that can come off as sexual (intended or otherwise). While others are being changed to make sprite work and comic work much easier to do with less details and more simple/elegant designs. Some will be kept in tact with male character designs being adjusted for the sake of keeping things balanced as much as I can given the gender ratio is mostly female (with Sarina as the protagonist) and few male characters mostly all side characters save for 3 Daichi, Gigs, Miguel. Though Miguel has not be drawn. Will have fix that so that it's more balanced out evenly before I finish writing the story. The main change is removing most of and very likely all signs of cleavage windows, and less revealing outfits. While gigs himself is pretty revealing his design might be changed a bit to give him a closed shirt or something similar. Daichi's open belly will be kept and a few other designs will only receive minor changes. Kazumi and the rest or her guild will be kept mostly the same (save for Tsunadai for reasons mentioned above) as male (not yet drawn) and female members wear the same styled bodysuits with belt count and color varying from grunt to major character. And Stealth armors are a uniformed but entirely separate design from said bodysuits. I'm also going to be cutting back on characters both male and female wearing heels. There's little reason for them to wear them and what's basically a platformer with a web comic adaptation. a few might be kept but honestly I just don't want people calling this Dead or Alive: Furries Edition. If that happens in a review after all is said in done (be it the game or comic or both) then I've failed as a content creator and probably won't be hearing the end of that among whatever small fan base I manage to get if at all. Feed back is always appreciated. More updates later. Last edited by Kyanbu The Legend; 08-07-2017 at 08:19 PM. The server time is now 01:04:22 AM.